I'm thinking of a valentine teatime for two. Even though I've been busy lately, I can't let Valentine's Day go without a little recognition. Perhaps that is all the more reason that we should stop and enjoy the company of the one we have declared our love to. I'll admit that this was a "same day"
idea that I got together in the afternoon, while my husband was at work. After dinner, I set up a relaxing, cozy area for the two of us. 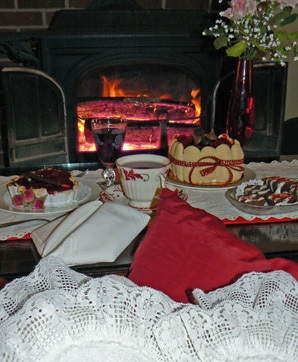 I pulled the coffee table - excuse me, tea table - in front of the fireplace, laid down a red runner I have from Christmas and topped it with a white doily. A tall vase of roses (two, of course) go next. - I know red is traditional for Valentines Day (they stand for passion), but I have always preferred any other color beside red for roses, so I went with pink (they mean romantic love). Then I gathered some thick, red throw pillows and some small white ones (I even have a heart-shaped one) and arranged them on each side of the low table. A heart napkin fold was just the thing. Next came the desserts - individual cherry tarts, tiny brownie cups, and a ladyfinger cake topped with strawberries. The red Rooibos was poured from a side table, as well as a glass of red wine (you can also go with red grape juice or just the rooibos). Since I didn't have much time when I decided to have this tea, I bought my goodies at the grocery store and embellished them with my own touches, except for the cherry tart. I invited my hubby to the table (he was suppose to stay out until notified) and we partook of our valentine dessert tea. talk. After our sweet interlude, we settled back on the pillows and relaxed -taking time to stop and smell the roses. I bought this ladyfinger cake, filled with strawberries which I garnished with chocolate kisses, and tied with a red ribbon. 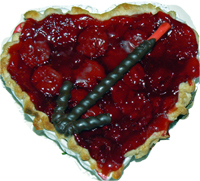 My 'easy way' cherry tart was to make a pie crust, fill it with canned (gasp!) cherries, sprinkle some granulated sugar on top and bake. Brownie cups made in little tart pans are good bite sized portions. 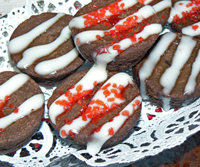 I also bought these and then lined the tops with a glaze (powdered sugar and milk). Then sprinkled red sugar crystals on top. Rooibos, called red tea, is a good choice for a Valentine teatime for two with it's naturally sweet taste and red hue. It doesn't have to be a Valentine Tea for Two to stop and smell the roses and have a dessert tea with your honeybee (Sorry, I had to say that, Tea Party Bee is looking over my shoulder). When you find an hour or two open to spend time together (if you don't have time - make time!) - seize the moment and instead of relaxing in front of the TV, fix a quiet teatime instead. You two will be glad you did.